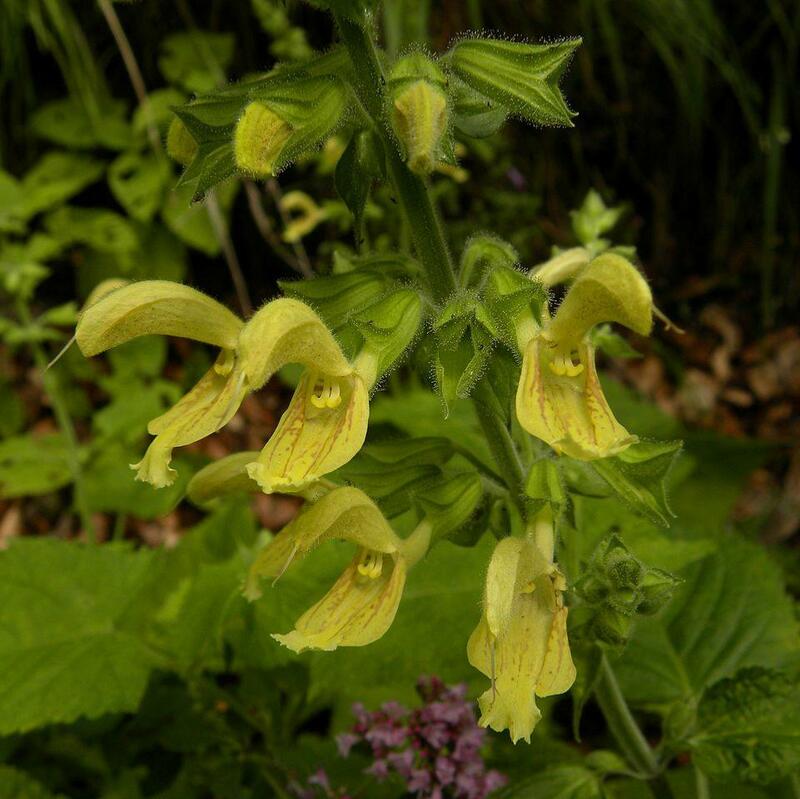 Salvia glutinosa is an unusual Salvia, for being both hardy and one of very few that are yellow flowered. Salvia glutinosa grows to approximately 40–60 centimetres (16–24 in) tall. The stems are erect, with bright green hairy leaves that are about 13 cm (5.1 in) long, with petioles of about 8–10 centimetres (3.1–3.9 in). The leaves are deciduous, toothed, pointed, hairy and glandular. With the first frosts, foliage disappears beneath ground. All parts of the plant are covered with sticky glandular hairs, especially the lime-green calyces and the flowers, resulting in the name "glutinosa". These sticky hairs probably have a protective function against predators. Flowers grow in whorls of two to six, with pale yellow flowers speckled with maroon. The flowers are supported by tiny persistent bracts and have a length of 3-5 centimetres (1.2-2.0 in), which is quite big for a sage. The flowers have two stamens and a bell-shaped calyx. The flowering period extends from June to September. Common names include 'Jupiter's Distaff' and 'Sticky Sage'. 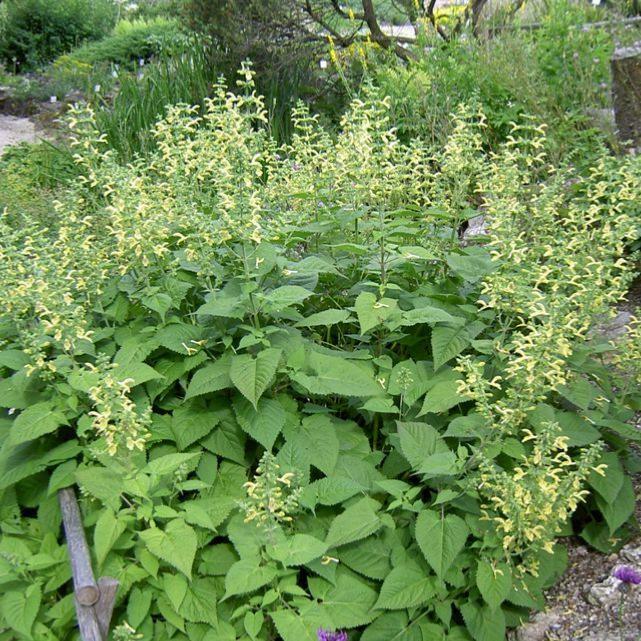 Salvia is the largest genus of plants in the mint family, Lamiaceae, with approximately 700-900 species of shrubs, herbaceous perennials, and annuals. The ornamental species are commonly referred to by their genus name Salvia. Requiring little water or attention, this vigorous species really only requires a well drained site in a sunny position. Succeeds in any good soil in full sun or partial shade. Plants are hardy to about -20°c. Plants can be killed by excessive winter wet. Members of this genus are rarely, if ever, troubled by hungry deer!